Annesburg Tavern actually has an interior... Can't get inside though, I've tried so many times! The store has probably an interior too. I totally suspect this was a full tavern cut from the game. Thank you for getting a peek inside! Across from it was a General Store too if I recall. What we got instead was a gun shop with a weird neighboring building hotel. I also noticed the Post Office has a full man-sized door safe in it. The biggest thing... the red coal building has a lot of things going on in it, like the train coal transfer under it. Yet, it's only used in that one MEH mission. Dutch has spent most of the game complaining about how Cornwall as done everyone wrong. On and on... okay, so this must be the big baddie of Red Dead! Expect an epic mission or series of missions chasing down Cornwall! WRONG, hahahaha... nope, Dutch shoots Cornwall in a cutscene, no player choice, can't even inspect the body. The actual mission is you trying to flee the area. It's like talking about Lex Luthor for 3 movies then having Batman swing in to execute him before you get to even talk to the guy. Je soupçonne totalement que c'était une taverne complète du jeu. Merci de jeter un coup d'oeil à l'intérieur! En face, il y avait aussi un magasin général, si je me souviens bien. Ce que nous avons eu à la place, c’était un magasin d’armes et un étrange hôtel voisin. J'ai aussi remarqué que le bureau de poste avait un coffre-fort complet à la taille d'un homme. La chose la plus importante… le bâtiment au charbon rouge contient beaucoup de choses, comme le transfert de charbon de train sous celui-ci. Pourtant, il n’est utilisé que dans cette mission MEH. Dutch a passé la majeure partie du match à se plaindre de la façon dont Cornwall avait mal agi. Et ainsi de suite ... ok, donc ça doit être le grand méchant de Red Dead! Attendez-vous à une mission épique ou à une série de missions à la poursuite de Cornwall! FAUX, hahahaha ... non, Dutch dirige Cornwall dans une cinématique, aucun choix de joueur, il ne peut même pas inspecter le corps. La mission réelle est de vous essayer de fuir la région. C'est comme parler de Lex Luthor pour 3 films, puis demander à Batman de l'exécuter avant même que vous ne parliez au gars. I I also wonder if Armadillo also has an interior for the gunsmith and the doctor's office. 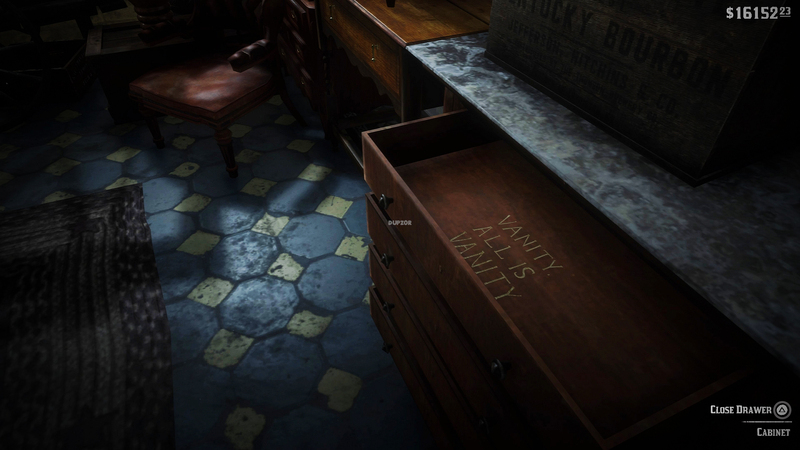 I checked the doctor's office at Strawberry, but the interior doesn't load (we can see it in an epilogue mission). 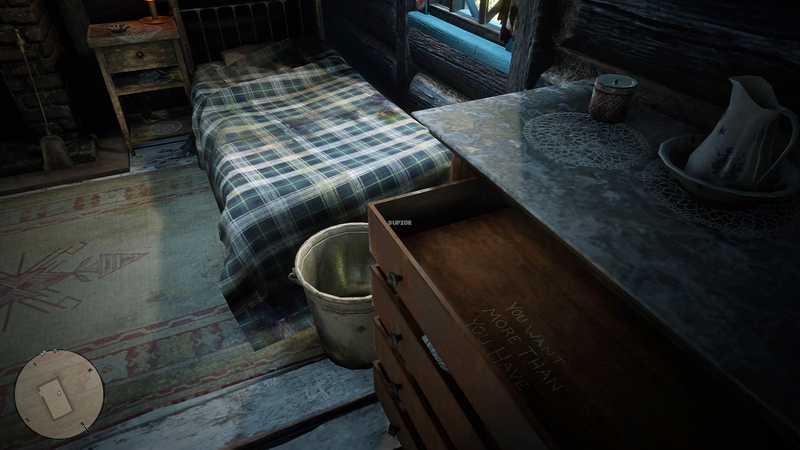 There probably a lot of unused interiors in this games. I I also wonder if Armadillo also has an interior for the gunsmith and the doctor's office. The doctor's office does, however it's incomplete. No textures, you can walk through the counter, and sand blows through the walls. The schoolhouse/cinema also has an incomplete interior. The gunsmith does not. I know most of you have explored extensively outside of the map, and this is one of the more visited locations, but I wanted to start documenting all the main landmarks or points of interest outside of the map since I feel like they deserve to be seen, and talked about. @DuPz0r can you do a video on those large Crevasse That’s north of Grizzlies West? It’s near the glacier area. I'm a bit out of the loop on this subject since I stopped exploring to finish my walkthrough, what's the current way of getting out of bounds? 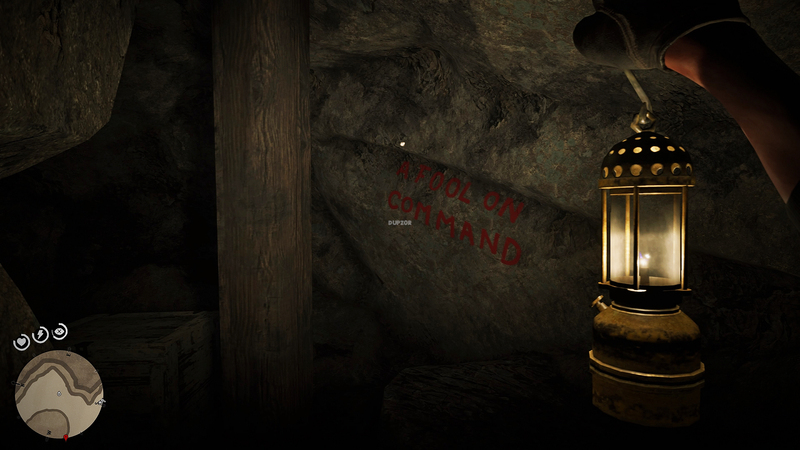 If you have a save point with that out of bounds camp, it should still work (I haven't update with latest yet). DuPzOr has a video getting out on the far northeastern side I believe. The more I run around this northwest out-of-bounds area, the more I think it was made for an earlier mission. Maybe it was the route Dutch took everyone to escape Blackwater? So many of these areas couldn't have been created by terrain generation. They're too specific. A = the Avalanche with hand placed objects. D = side discovery... the terrain patches don't match here. You can see under the world and watch streaming pop in and out. This seam matches a grid edge on the leaked map. E = a background lake you can explore. The water is only a texture sheet with no collision. H = the larger glacial chasms documented by DuPzOr suspected to be where John was originally trapped. There's some notable audio noises triggered in this area. Perhaps the gang fled up north, avoided an avalanche, wound their way up around chasms only to have John fall into one. Click it again to get even larger. Nice interpretation Alz, I also suspect that there was a mission cut from the early game, it's just too much detail to be made for nothing. I honestly don't understand why Rockstar would go through all that work, meshing, adding fog, adding an entire 'story' there, while we never, ever, see it in game. @a z I think you are right, it wouldn't make sense to create a path there, including all kinds of detailed stuff, for nothing. I can confirm that the drinking glitch does indeed still work in the latest patch. At least in the Epilogue. The Frozen Lake was the next in my list of Points of Interest. 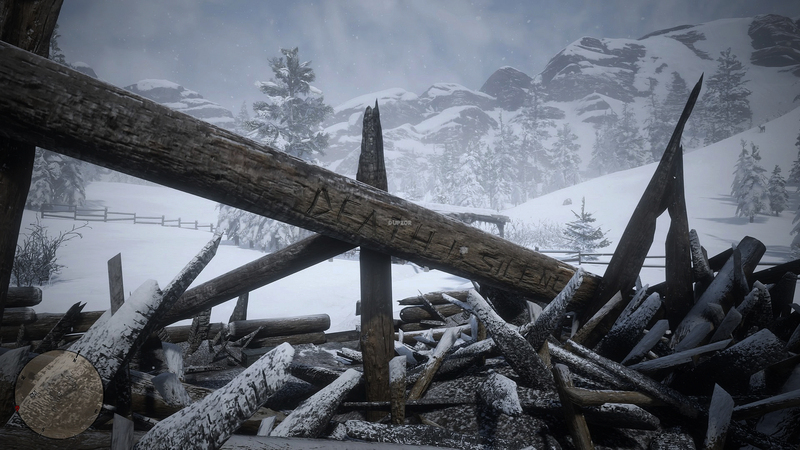 There are so many cool things to look at in the snowy part of the map, that unless you stop to look, you can easily miss, and pass straight by. 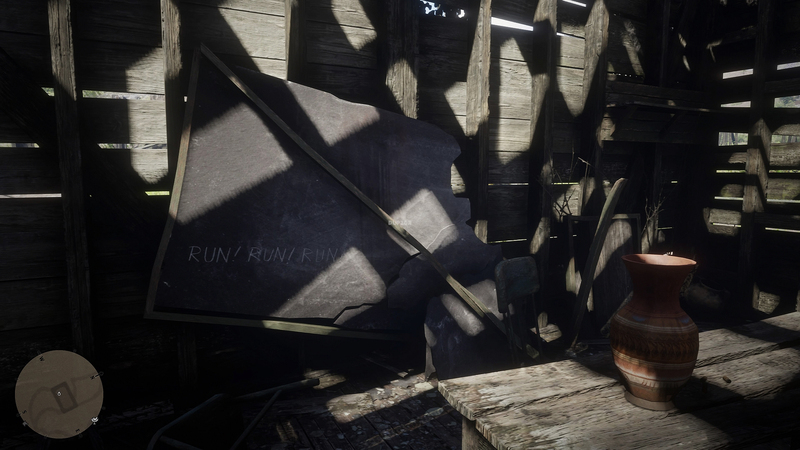 I've recently found out that there are cheat codes that exist in the world of RDR2 in the form of Easter Egg. 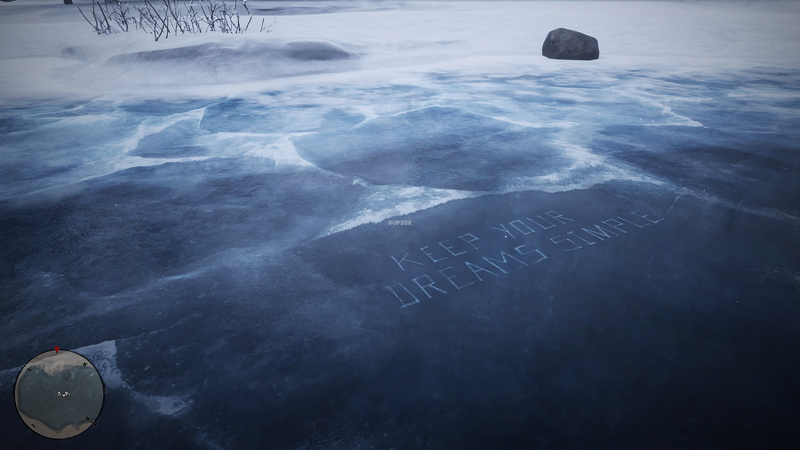 I remember seeing writing carved into things but never really made the connection. So now I am aware of their existence, I decided to look on the web for these locations. And I have had zero luck in doing so. 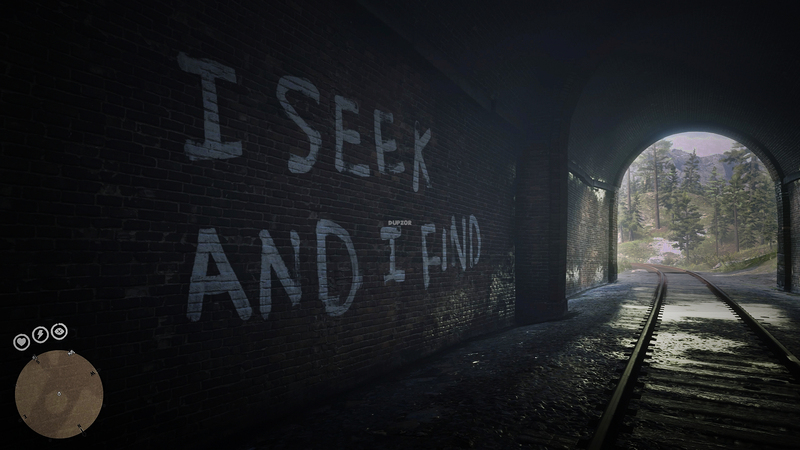 I am aware all the cheats have been available since the game's release, but I was more interested in the locations. 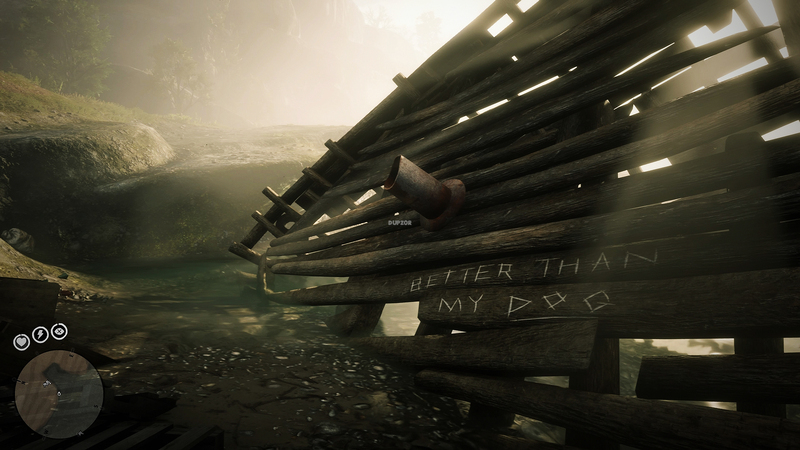 Now then, after an extensive search around the map these past few days, I have found 15 locations that have carvings of cheats on them. Now I also realize that some cheat codes are from newspapers, so now I'm narrowing them down to see which ones are still missing. I was hoping you guys could help me since I haven't seen a single shred of compiled data for all these locations online. I decided to post it here since the mapping thread is full of regulars that have probably covered the map many times over, and may know of a carving or two that may be missing from my compiled list. Red is Newspapers, green is the ones I've found and white is still unknown. #29 Would you be happier as a clown? Could those 14 codes be located somewhere in the world? Let the hunt begin! And of course, I'm charting them in map form too! That leaves 13 more phrases! I'm certain this is the spot for El Hueco, I'm just not 100% sure what it was. A bayside fishing village, a revolutionary hideout, a cove or cave? Dupzor maybe you could make a separate topic for those cheats to see if we can find them all, most of the guides on the internet are indeed incomplete. I've been trying to get on Nekoti Rock for the past couple of days, with no luck. You can sort of get across to it from outside of the map, but then there's a tall slope that I just cannot get up. Anyone else had luck getting on top of it? 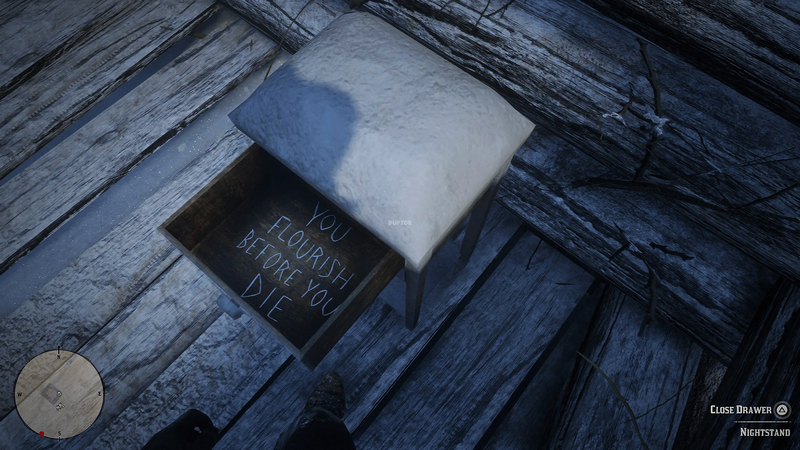 It would be really interesting to see if there is anything up there to suggest the mineshafts or even the spot where Dutch killed himself in RDR. Holy cow @DuPz0r great work!! So I saw the Death is Silence video, and it gives you stealth weapons, but is there a list of what cheats map to what benefit? 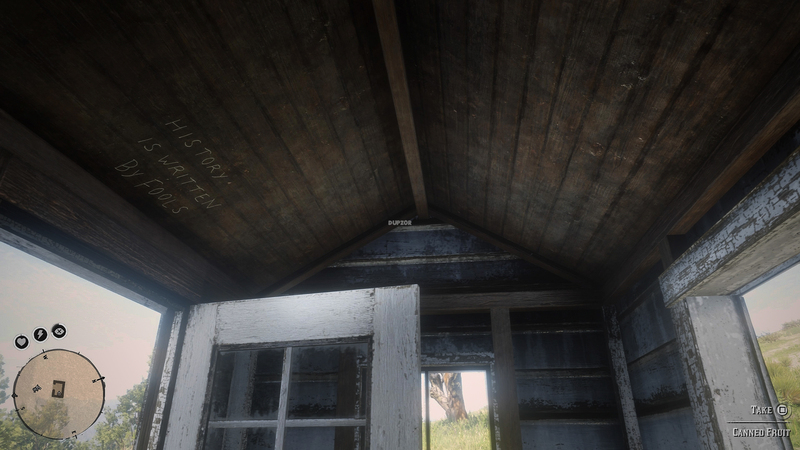 Separately, and I've tried to stay abreast of the map stuff, but I'm puzzled about Guarma. To be candid, Guarma pisses me off. It's so rich and completed but only shows up in a linear chapter and you can't really free roam it in story mode. I've seen the ferry thing to get back to Guarma, but is there another easier/quicker way to get there to free roam? Apologies for asking a fatuous question that's likely been asked and answered several times. I've been trying to get on Nekoti Rock for the pas﻿t couple of days, with no luck. You can sort of get across to it from outside of the map, bu﻿t then there's a tall slope that I just cannot get up. Anyone else had luck getting on top of it? 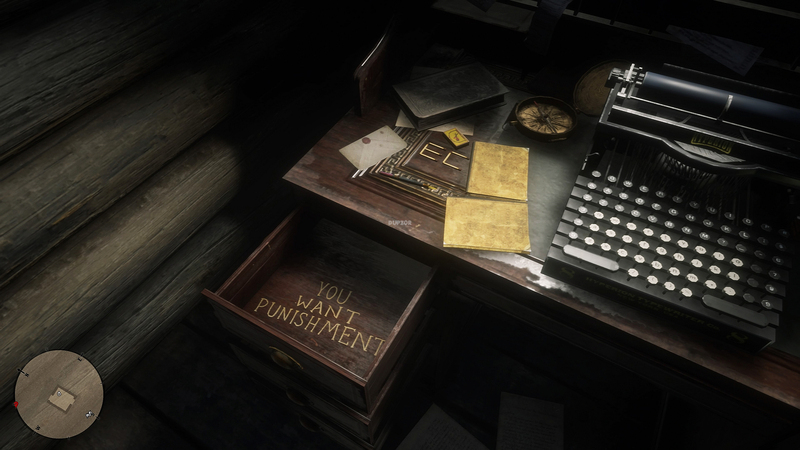 It would be really interesting to see if there is anything up there to suggest the mineshafts or even the spot where Dutch killed himself in RDR. I remember the disappointment when Cochinay was empty and the cave entrance from the last game was no more than a shallow nook in the rock wall. There's no ledge where Dutch killed himself, no path up to Brumas' cave, no old mining operation and broken train track ... which also had the 3rd cave in the area. 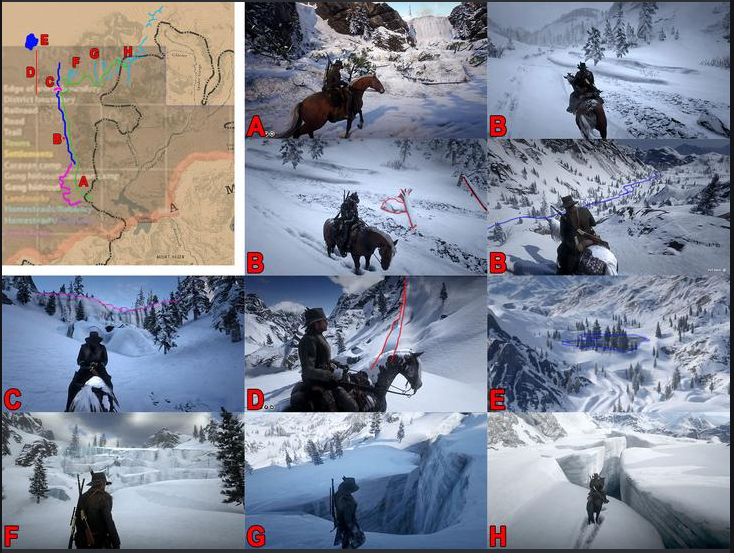 Other than our theories about there being cut story missions from the start, I also noticed that the Marston Glacier mission was cut slightly. And by that, I mean the part of the map where you don't see them, go through the glacial fault. unnecessarily cut imo, since we never get to go back there and see it. I never knew about this short path! I thought it was always the larger faults on the edges. I'm guessing you never found a path down to the deeper ones without buggy-falling. If it only had one section like this short path to get down and back. I remember you pointing out a possible blocked cave entrances though. Maybe that deeper blocked section was the original mission space. Then they changed it to this upper area. User tests might've revealed the dull frustration of limping along with John at such an early mission so they cut the route. In an open world game, all spaces should have at least a non-mission purpose to explore. For example.... it could've been home to something like the Legendary Bobcat. All this not utilized content. It starts to hurt actually. - Upper Northwestern Territory (CUT content): we have a HUGE snow region, including lakes, paths, avalanches and glaciers. - Northern & Northeastern Territory (at least party CUT content): To the north of Ambarino is a huge forest area, including Tempest Rim (cut). This gradually changes to mountainous canyons (very similar to the Apache territory in CoJ: Gunslinger), including paths and riverbeds (with no water) in the north east. We even see burned trees and lakes which is an extension of areas we can go to. 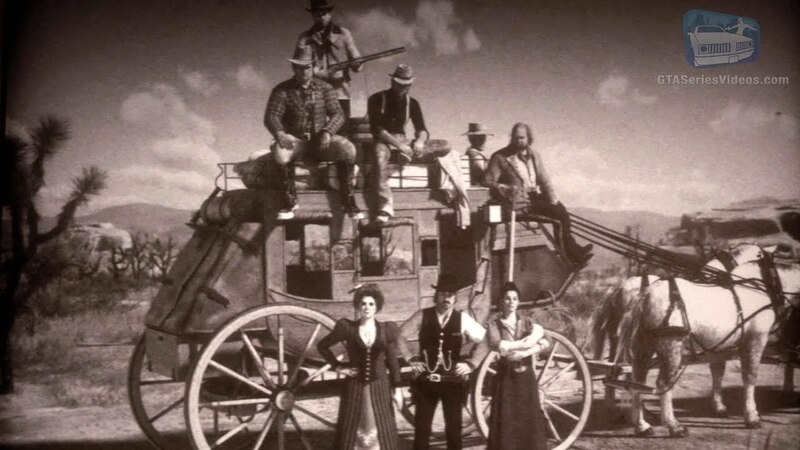 Possibly we could see this as a DLC if Rockstargames chooses to do anthology stories for Charles and Sadie. I even found an easter egg in the most eastern snowy area, a rock in the shape of a rodent. - Nuevo Paraiso: We have Mexico which is fully meshed, just no towns :(. 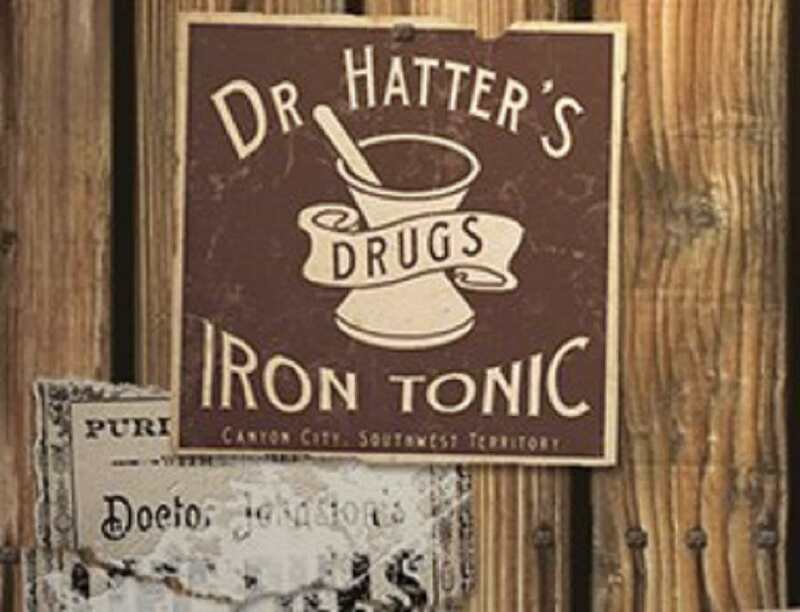 If you want a map dlc, this is the most likely one we will get. 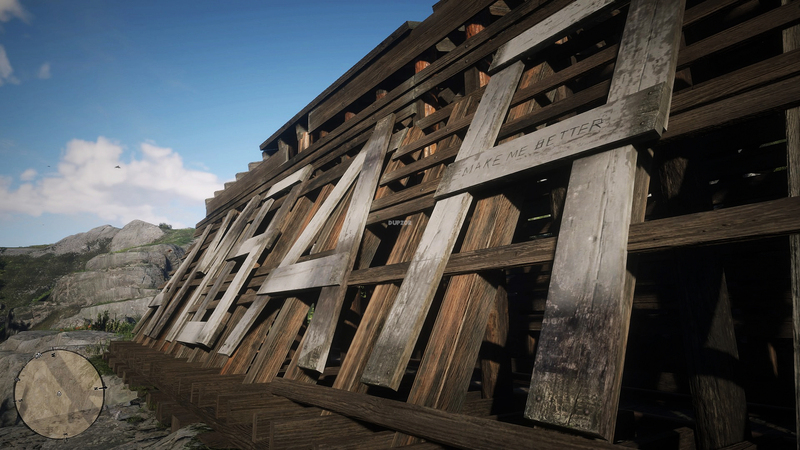 - East Elizabeth (south east of the Great Plains): Not utilized and we have all tried to go there since RDR1 (don't lie, you tried it). It looks like a combination of Hennigan's Stead and the Great Plains. Quite detailed in the northern area, gets less detailed the more you go south. - High Plains (Lower North Western Territories): confirmed area North of New Austin... this area is absolutely huge. It even features multiple valleys. Probably also the location where the picture was made we see of the gang in the credits. Not meshed totally, but features to some extent foliage. Also home of the Redemption Mountains, which serves as a natural barrier between the Northwestern territories, New Austin, West Elizabeth and Ambarino. - Eastern USA: Haven't been able to go there myself, but it is still present in the game area. It could be used to extend the bayou area and add some farms and plantations. 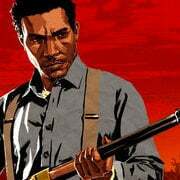 - Eastern Mexico: To the south of Saint Denis is an area we won't see in the single player at all. 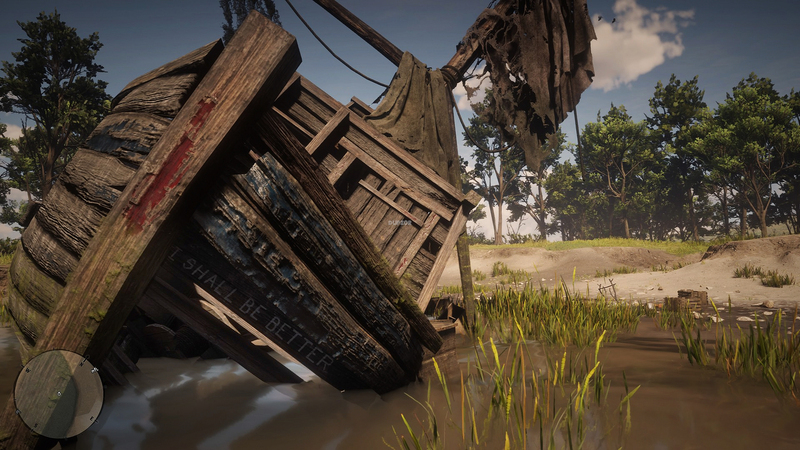 It looks like a combination of Guarma and Bayou countryside. Would have loved to see this utilized in some form for Mexico dlc. - Northern valley (North of Tempest Rim, located in the Northern Regions): looks like an area straight out the North American Pacific Northwest, as seen in TheHunter: Call of the Wild. Could be epic for either an off map experience or an Alaskanesque/Canadian region. - Eastern USA: features a large river, eventually leading to out of bounds 'sea'. - Western USA, only visible from the High Plains or Northern Territories. - Southern Mexico: Huge valley south of Nuevo Paraiso. Only slightly meshed. - Guarma: Like... what the f*ck. Why is there an entire island not utilized for gameplay. It is there. It looks AMAZING and we all want to go there. At least multiple areas are cut content. So what would we be able to see in the future? Enough options for DLC since some regions "only" need to have some locations added in the form of towns and out of bounds barriers and fix some glitchy areas. 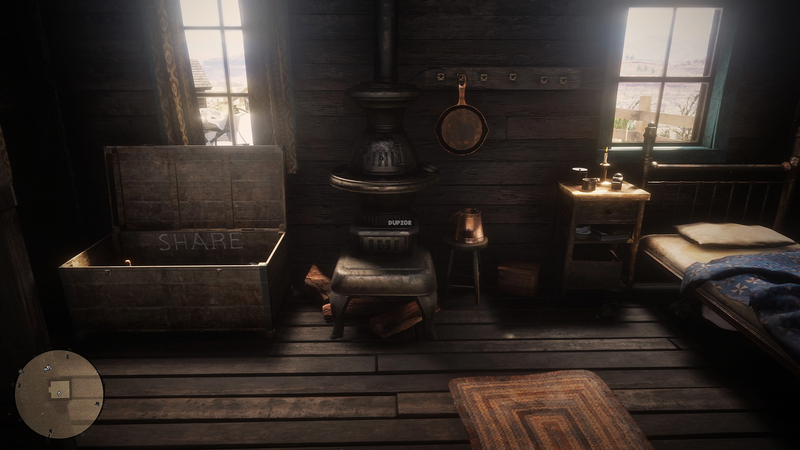 - Nuevo Paraiso (possibly coming in a RDR1 remaster). These areas would have to be created mostly from scratch, since they are not even (fully) meshed on the current map. Thank you for reading (if you did come this far ). Thanks man for detailing this. Personally, I would be thrilled to see Canyon City and the Southwestern Territory. I have a theory this is where the gang came from before they entered "the map". Remember they were chased from the west and over the mountains. 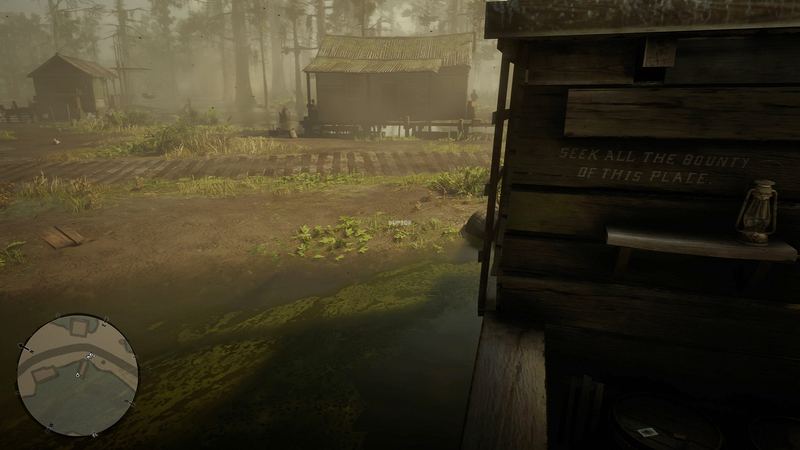 The area north of New Austin would also be cool to explore in a future RDR3 or DLC as the gang must have come this way fleeing from the west (in my theory)to the east. I agree with that theory, since it is the only one which actually makes sense. It could also be East Elizabeth, but I really doubt that would be. It's more moderate climate as the desert we saw in the picture. The High Plains (north of New Austin) is the only logical location, especially since they were chased from the west over the Redemption mountains/Grizzlies to West Elizabeth. It would make sense both story wise and by geography. Also this location is absolutely huge. The meshed location is about 1.5x-2x the size of New Austin. For now I call these the Northwestern Territories, in lack of a better name, but I guess these that later in the franchise, this will exists of two or even three states. This would also be the location where the soldiers from Fort Mercer went to fight the Indian Wars. While the southern valleys would show parts of Utah and Nevada, the northern valleys would more closely resemble Montana, Wyoming and Idaho. 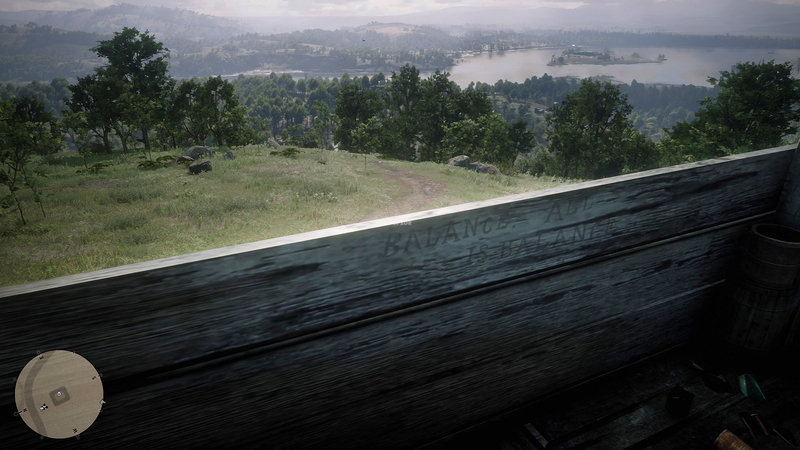 As you can see, the landscape is quite similar to New Austin, so it would definitely be just north of New Austin (the other side of the Redemption Mountains). *Although I wouldn't be surprised if this was taken in GTA V or New Austin/Nuevo Paraiso anyway. Canyon City would be placed in the Southwest Territories. The Southwestern Territories in Red Dead would most likely have influences from the Arizona and California deserts (as seen in GTA V), just like New Austin. Don't forget the name 'Canyon City', which makes me guess it features Grand Canyon like locations based of (indeed): Arizona. So we can already get some sort of rough outline of how the territory would look like.